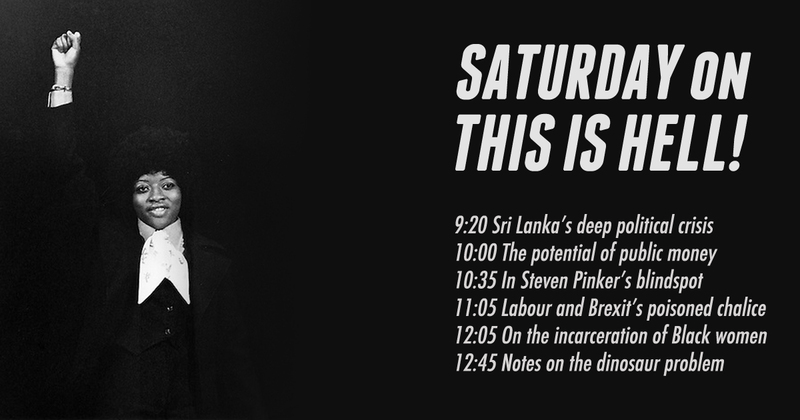 9:20 - Critical theorist Kanishka Goonewardena explores the roots of Sri Lanka's neoliberal / ethno-nationalist crisis. Kanishka wrote the article The Crisis in Sri Lanka for Jacobin. 10:00 - Geographer Lavinia Steinfort examines the potential of creating new, public money in the people’s interest. Lavinia wrote the essay The Power of Public Finance for the Future we Want for the Transnational Institute's State of Power 2019 report. 10:35 - Anthropologist Jason Hickel explains what Bill Gates and Steven Pinker don't understand about global poverty. Jason wrote the post A letter to Steven Pinker (and Bill Gates, for that matter) about global poverty at his site. We talked with Jason in June 2018 about his book The Divide. 11:05 - Writer Richard Seymour surveys what remains of Labour under Brexit's combustible, nationalist unity project. Richard is author of the essay Brexit and the "white working class" posted at his Patreon page. 12:05 - Writer DaMaris Hill traces a history - and present - of Black women imprisoned in America. DaMaris is author of the book A Bound Woman is a Dangerous Thing: The Incarceration of African American Women from Harriet Tubman to Sandra Bland from Bloomsbury. 12:45 - In a Moment of Truth, Jeff Dorchen handles the dinosaur problem.